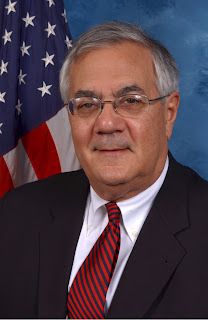 Rep. Barney Frank (D-MASS) and his partner James Ready have been in an intimate relationship since 2007. It was disclosed today that Frank was present when Ready was arrested for growing marijuana on his [Ready] property. Barney was visiting Ready’s home in Maine after their relationship began. Frank was sitting on Ready’s front porch when the police happened by. They found pot growing on the side of the house, or in the backyard (out of Barney’s site). Later the police came to the door and arrested James Ready. He paid a civil fine and remaining charges were dropped in 2008. In July 2009, Barney Frank introduced legislation to “strengthen legal protections for state-authorized medical marijuana patients.” Eight of the co-sponsors are Democrats with one, Dana Rohrabacher, a Republican representative of California joining. I’ll surprise more than a few of my friends by saying that I also support marijuana for legitimate medical use – and no, I do not know how to define what “legitimate medical use.” This is not the post to get into the details of marijuana and cancer or marijuana and multiple sclorosis, but I will say, until recently, I have not considered marijuana and its deriviates as a possible source to stop or diminish tumor growth, until this. In the video below, listen as the interviewer from FOX25 “offends” Rep. Frank. I am absolutely loathe to agree with with man about anything, but here I am doing so – at least in theory.